Oregon’s high desert country gets less attention than deserts in the Southwest, but it’s just as fascinating. The Cascade Mountains block moisture from reaching Central Oregon, creating rain shadows and warmer air to the east. As with much of the Pacific Northwest, Central Oregon high desert country is rich in geologic features and recreation opportunities, particularly around Bend. Though you may be tempted to bypass Newberry National Volcanic Monument, don’t drive by. Instead, spend a day discovering its unusual geology. 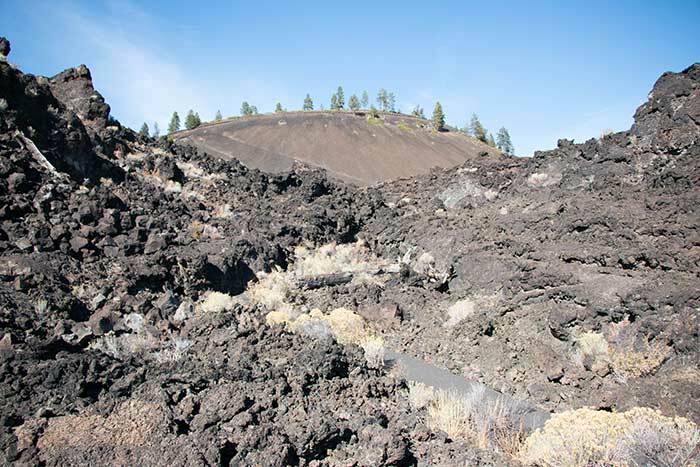 Newberry’s repeated eruptions covered a 1,200-square-mile area with lava flows. Today, the U.S. Geologic Survey considers Newberry a high-threat volcano due to its history, hot springs, and proximity to 200,000 people. Like its more famous big brother, Crater Lake, Newberry also created a lake, or a caldera, about 75,000 years ago. 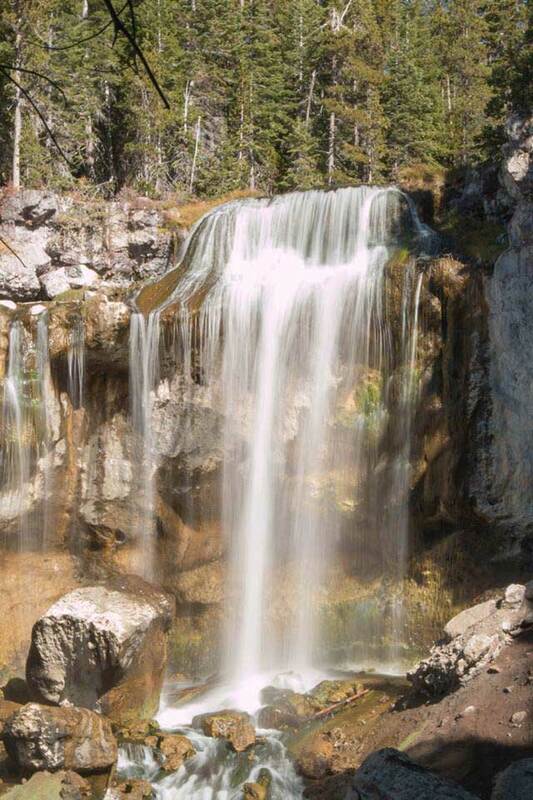 As part of the Deschutes National Forest, this area offers lava fields, hiking trails, an obsidian outflow, boat-able lakes and fishing, a waterfall, and even a mile-long lava tube cave. Several hikeable trails beckoned us at both Newberry’s north and south entrances. We started south by the Paulina Visitor Center (pronounced Paul-EYE-nah and named after a male Klamath chief). 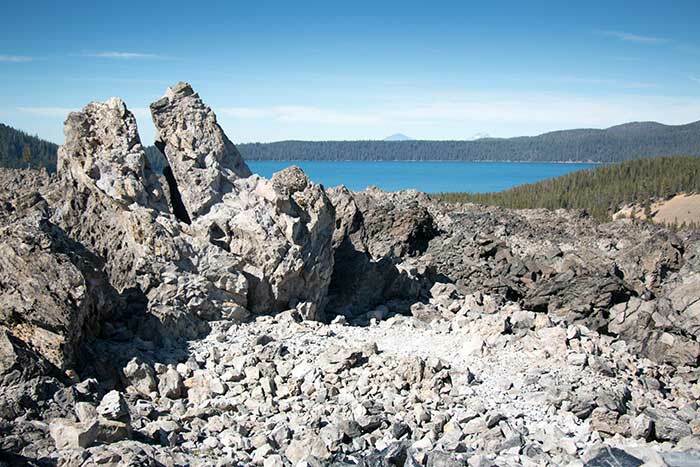 The gotta-see hike here is Big Obsidian, where chunks of real obsidian glitter in the sun. Some pieces are as big as Volkswagens, others small enough to put in your pocket. This outflow is not for collecting, though, so you can’t take any home. But you can take the one-mile, partly paved interpretive trail that winds you through the obsidian itself. We felt like we were weaving through a NASA exploration photo, and we were half-right: NASA used this rocky area in 1964 to teach astronauts about what they might encounter on the moon. If you fish, try Paulina Lake for kokanee, trout, and chub. We wanted to hike, so we headed up the road from the lake and took the quarter-mile route to the bottom of the 80-foot Paulina Falls. The path was narrow and a little tricky, but worth it: the bowl-shaped falls are gorgeous. From the Paulina Lake visitor center, we drove about 20 minutes north along US Route 97 to Lava Lands Visitor Center. We learned later that Highway 97 was built in the natural corridor between the lava fields. The valley has been used for travel for thousands of years by animals and humans. Deer and elk migrated this way, and Native Americans also used the valley as a trade route. The Trail of Molten Land at Lava Butte awaited us right behind the visitor center. Dotted with gray rabbitbrush and interpretive signs, this fairly flat, easy, paved loop guided us through a field of black and gray basalt chunks. Then we lazily drove to the top of Lave Butte. You can also grab a $2 shuttle or sweat your way up the steep, 1 3/4-mile hill. Whichever way you choose, make sure you get to the top, stroll around the quarter-mile rim trail and take in the dramatic 360-degree views. The fire lookout atop the red landscape still operates as one of the busiest in the state, and a volunteer ranger often stands ready to answer your questions. Newberry National Volcanic Monument, Deschutes National Forest, 541-383-5700. Make sure to visit both the Paulina and Lava Lands areas. Day fee: $5. Paulina Visitor Center is open May-October; self-serve the rest of the year. Limited parking; no lot. No toilet; restroom available across the street at the campgrounds, when open. Recreation fees required at specific sites. From Bend, travel south on Highway 97 23.5 miles, then turn left onto County Road 21 for about 12 miles. Lava Lands Visitor Center, 58201 South Hwy 97, Bend, Oregon. Open May - October. Restrooms, films, exhibits on geologic and cultural history, gift shop, bookstore. Trail of Molten Lands is partly wheelchair-accessible.